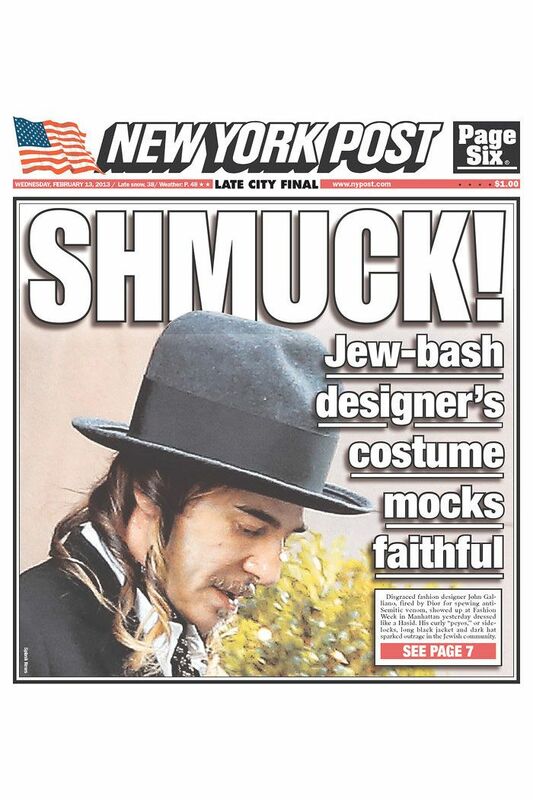 This morning, the Post slapped a photo of John Galliano, taken by paparazzi on the street yesterday, on their front page under huge letters: “SCHMUCK.” His offense? “Dressing like a Hasid to attend pal Oscar de la Renta’s Fashion Week show in New York.” The corresponding article states that Galliano’s hat, curly hairdo, and long jacket “stunned New York’s Jewish leaders,” and includes a series of angry quotes from various Jewish New Yorkers, including Williamsburg community leader Isaac Abraham and Brooklyn assemblyman Dov Hikind. The piece also quoted Galliano’s publicist, Liz Rosenberg, who said, “Your accusations are not at all correct.” And she’s right, because Galliano has been wearing this exact outfit for ages, right down to the ringlets in his hair — which are definitely not peyos, as they circle his whole head. The exaggerated bowler hat, baggy cropped pants, and long jacket are such well-known components of his uniform that Bill Gaytten, Galliano’s successor at his namesake line, modeled an entire menswear collection on them for spring 2012. Indeed, the hat Galliano wore yesterday looks to be one of Gaytten’s recent designs. 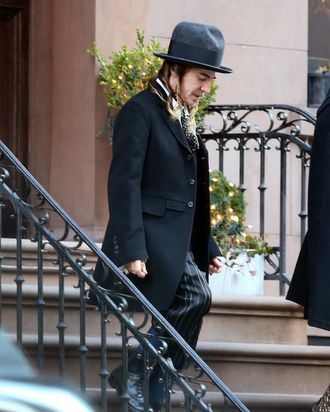 One could argue, as the Post does, that Galliano should have thought harder about his wardrobe before stepping out in the Jewish capital of America. But he has been so under the radar since he arrived here, not even allowing himself to be photographed at Oscar de la Renta’s show yesterday, that it’s hard to make a case for him purposely “mocking” the Jewish faith with his own clothes. But the backlash against his revival was inevitable, was it not? If this is as bad as it gets, then he’s doing just fine.